Hundreds of first and secondary schoolers participate in the 2019 National Education Robotics Day. The students competing on the tabletop playing field with robots they had designed and built. The exercises help students hone their critical thinking and team-building skills, and develop STEM knowledge. Winners of the FIRST LEGO League Junior jumping for joy. 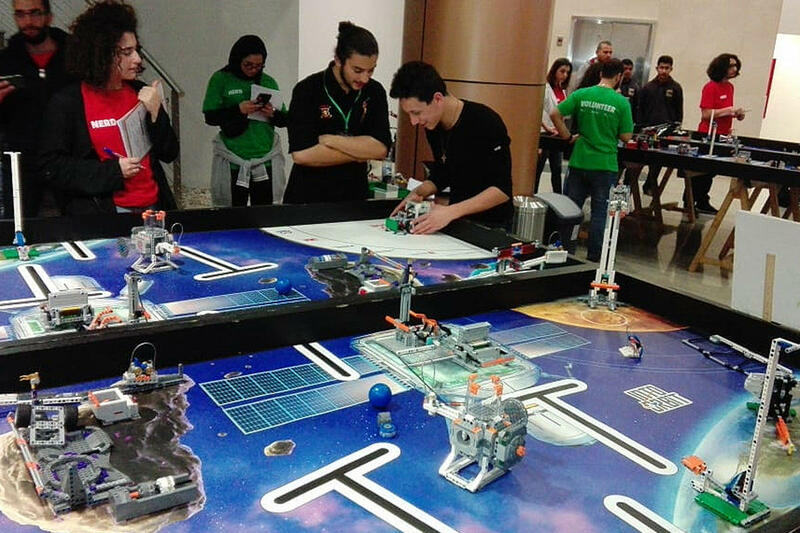 On a Saturday in mid-March, LAU’s Byblos campus buzzed with hundreds of students participating in the 2019 National Education Robotics Day (NERD), an annual series of competitions aimed at promoting science, technology, engineering and math (STEM) education through games and challenges. Under the patronage of the Minister of Education Akram Shehayeb, and in collaboration with the Institute of Electrical and Electronics Engineers (IEEE) Lebanon Section, LAU’s School of Engineering and the Education and Technology Center (ETC) brought together 750 elementary, middle-, and high-school students from across the country to compete, learn and win. “LAU and ETC are pushing the boundaries of middle- and high-school education in Lebanon, highlighting the need to train our youth from a young age on the technologies of the 21st century,” said Assistant Professor of Electrical and Computer Engineering and Interim Assistant Dean Joe Tekli. As the event commenced with SOE Interim Dean Raymond Ghajar’s welcome note, the representative of the Minister of Education Nader Hadifa thanked LAU for hosting NERD 2019 and discussed the ministry’s plan to modernize the curriculum in Lebanon to incorporate technological advancements. Founder of the NERD Open Championship Ghazi Mtawaa expressed his desire to see this curriculum development materialize. “We hope that the Ministry of Education in Lebanon further integrates the teaching of robotics and technology in schools because it is the future,” he said. 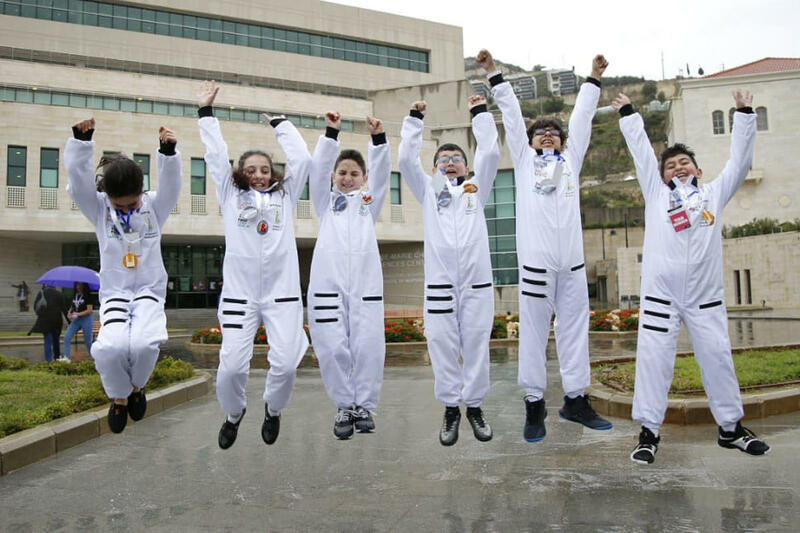 Under the theme A Mission to Space, 52 teams from various Lebanese schools took part in three competitions. In the FIRST LEGO League (FLL) Junior, six to 10-year-old students design and build a model using LEGO elements and create a Show Me Poster to solve a real-world challenge. As for the FIRST LEGO League (FLL), students aged 10 to 14 research a real-world problem and are challenged to develop a solution using STEM concepts. They design, build, and program a robot using LEGO MINDSTORMS technology, then compete on a tabletop playing field with the guidance of two coaches. Exercises such as these help students hone their critical thinking and team-building skills, develop STEM knowledge, and understand that failure is an integral part of the learning process. “We learned that we need to cooperate and work together as one team,” said Mahdi Awada, a 12-year-old from the Al-Mostafa School who developed with his team an application that organizes the life of an astronaut in space. The third competition, FIRST Tech Challenge (FTC), allows high-school students to design, build, program, and operate robots. Guided by adult coaches, students enhance their STEM skills and practice engineering principles. “We gained experience that would benefit us in the future, especially if we are planning to study engineering,” said high-school student Rita Nehme. More than 130 judges and organizers – including six LAU faculty members and 19 students – oversaw the matches and evaluation process. Committees made up of two jury members each graded the students according to two criteria: model and poster, and core values. Ahlam Noureddine, a teacher at Sabeel al Rashad School in the Beqaa who served as a jury member, confirmed this. “The students learn to help others and show good sportsmanship. In this way, we can contribute to raising a positive generation that is more accepting of diversity,” she said. The winning FLL Junior teams were Astro Robo from Qemam Private School, Baalbek; Little Astronaut from Cedars Cultural School, North Lebanon; and Space Explorers from EDUTEK Training Center, the Beqaa. The 4th VORTEX from Bilal Fahs High School, Beirut and Tic Tac Toe FTC Chapter from Hasan Kasir High School, Beirut, were the winners of FLL and FTC respectively. The champions will represent Lebanon in each category at the FIRST World Championship in Houston, Texas in April 2019. 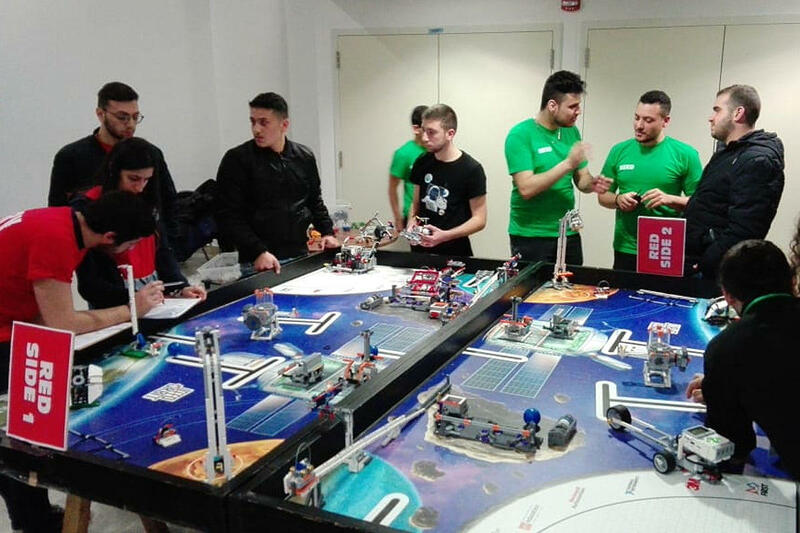 Other teams also have the chance to participate in the FIRST LEGO League Open International competition hosted in Lebanon for the first time at LAU Byblos in June 2019.